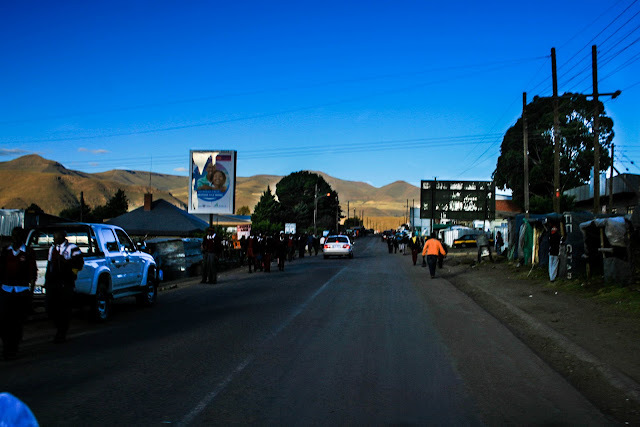 Music blaring from stereo systems combined with clapping, cheers, and flag waving as pick-up trucks drive around town promoting their party of choice in the upcoming national election. The same five songs on repeat at Big China - the largest grocery store on the main street. Muffled hymns from inside aluminium siding walls as I walk by one of the many churches in town on my way down to the river. Baritone voices set in time to marching feet as the local defense force passes TTL on their daily run through town. Men, women, and children -hundreds of voices singing in unison- as we walk through the streets of town to stand up for two children whose lives were cut far too short by violence. Soft harmonies and swinging arms as the safe-home bo’me teach a four year old girl a traditional Basotho dance. This is the soundtrack to Mokhotlong – and one that I won’t be forgetting any time soon.